Part of the FCC Hazelton facilities including: USP Hazelton with an adjacent minimum security satellite prison camp, FCI Hazelton with a secure female facility. 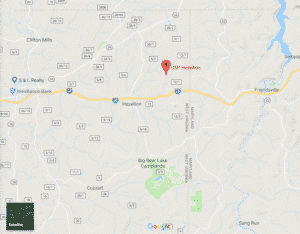 Location: USP Hazelton is in the mountains of Preston County, West Virginia, in the community of Bruceton Mills, approximately 35 minutes from Morgantown; 45 minutes from Uniontown, PA; and 45 minutes from Cumberland, MD. Background: USP Hazelton and the satellite camp were built in 2004 due to an increasing need for modern facilities to house the growing number of federal inmates. Both institutions are part of the Hazelton Federal Correctional Complex (FCC). The high-security portion of the facility was completed in 2004. Along with 768 general housing cells, it contains 120 “special housing cells” for especially dangerous prisoners. The USP has a history of violence and inmate deaths. Notable inmates include former Kentucky Agriculture Commissioner and University of Kentucky basketball player Richie Farmer (released in 2015 after serving 27 months for corruption). Housing: Inmates are housed in one-person and two-person cells. At the camp inmates are housed in dormitories. Health Services: Urgent care, medications, preventive care, and diagnosis or treatment of chronic infectious diseases are provided at USP Hazelton. Emergency medical and dental care is available 24-hours a day. Routine care is available through the submission of triage forms at the Health Services Unit. Psychology Services: All inmates are screened by Psychology Services staff upon arrival at USP Hazelton and the camp. Psychologists are available for individual and/or group psychotherapy. Inmates are notified of new classes and groups through postings on inmate bulletin boards. The Challenge Program, an intensive, residential program for inmates with drug abuse and/or mental health problems is also available. Residential Drug Abuse Program (RDAP): USP Hazelton and the satellite camp do not provide a Residential Drug Abuse Program (RDAP). They do offer Alcoholics Anonymous (AA), the Drug Education class, and the Non-Residential Drug Abuse Program (NR-DAP). Education Services: USP Hazelton provides GED, and English-as-a-Second Language (ESL), parenting programs. Adult Continuing Education (ACE), career counseling/Pre-Release Program (RPP) courses, and Microsoft Office 2010 are also offered. High school diplomas and post-secondary programs are available through paid correspondence programs. Advanced Occupational Education: USP Hazelton does not offer any advanced occupational education programs. Vocational Training: No vocational training is offered at USP Hazelton aside from the apprenticeship programs. Apprenticeship: The camp offers apprenticeships in Electrician and Powerplant Mechanic. Library Services: The law library is located in the USP Hazelton Education Department and contains a variety of legal reference materials for use in preparing legal papers. The Education Department maintains a leisure library. The library stocks reference books, such as encyclopedias, dictionaries, medical encyclopedias, college listings and synopsis, recent volumes of “Books in Print,” etc. These reference books are available for use within the Resource Library. Magazines, newspapers, and both fiction and nonfiction books are also available. UNICOR: USP Hazelton manufactures Army Combat Uniforms (ACU) Trousers, Diplomatic Bags, and GSA Tarps. Commissary: Inmates may withdraw money for family support, to purchase publications or for other approved purposes. Inmates are permitted to spend up to $360.00 each month, which does not include stamps or funds transferred from commissary to their inmate telephone account. Soda, food, clothing, shoes, and other items are available for inmate purchase. Recreation Services: USP Hazelton offers formal and informal recreation programs with a combination of competitive, recreational, and fitness type activities. The Institution HobbyCraft program is available in the Recreation Department, and includes canvas painting, watercolor painting, crocheting, drawing, and paper art.